Perhaps you should hold some garden work shops on your property, that way people like me can learn how to garden the correct way, and you would get a lot of your garden work done for you. My lettuce, spinach, and swiss chard is already turning bitter, it grew so fast and it seems like I haven't eaten much of it. When I bought this property I spent most of my time on clearing wooded areas, home and building construction, alternative energy projects, and working at my regular job for 28 years. What I didn't do was start my orchard and garden. But now that I'm retired I have a lot more time on my hands, and even though I got a late start on my garden and orchard, they are looking pretty good. Nice broccoli. I am wondering what you use to control the cabbage moth and her little green babies. 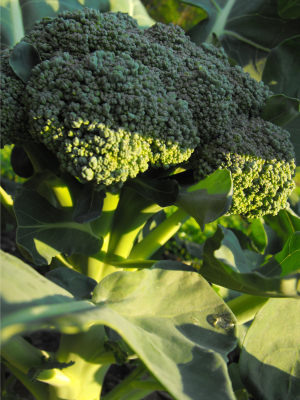 We can grow nice broccoli here but I gave up after blending up a few worms in a soup :). I tried BT and it worked but was constant work to keep up with it if it rained. Zimmy --- I consider having folks over for events like that now and then, and then I come to my senses. I'm just not a very social person, and spending a whole weekend playing hostess to strangers gives me the heebie jeebies! About your lettuce, spinach, and swiss chard going bitter: There are a bunch of tricks to eating lettuce in the summer, but I don't think that any of them are worth it. Instead, I consider lettuce a limited time opportunity. As soon as one bed starts bearing, I start another. In about a month, the first bed is bitter and I tear it out, just when the second bed is ready to eat. 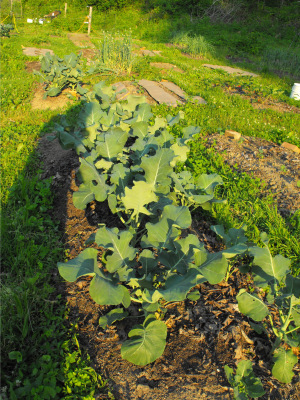 Then, once the weather gets hot, I just move on to summer crops. Our spinach and swiss chard don't go bitter, though --- it's odd that yours do. Our spinach is starting to bolt already, and I'll soon tear it out just like the lettuce. Swiss chard, on the other hand, is our easy summer green. I keep cutting the leaves a time or two per week, and it just keeps growing until the frost, never getting bitter or tough. The only thing I can think that you might be doing differently is not cutting it often enough?